I typically try to keep things light and fun over here on the blog. There's a lot of heavy stuff everywhere you turn and I like for my space on the internet to be a little big lighter - but lately there have been a lot of things HEAVY on my heart (and on several of yours) and so I'm taking the opportunity to share those today. As my blog has grown and changed it's provided some fun opportunities for me and my family. What started out as a way for me to share pictures with out of town family has grown into a way to connect with some amazing people and being able to share my heart and bring to light prayer needs has been the biggest blessing and privilege. I've mentioned the rain we've been receiving here lately, but it is nothing compared to what's been going on south of us. The devastation and lives lost are unfathomable and my heart breaks for those families affected. Like most of America, I've been following this story closely and have been praying for miracles for the McComb family and others still missing. Obviously they can use our prayers, but if you'd like to help monetarily, consider donating through Samaritan's Purse (they have a wonderful reputation and charity rating) as well as The Red Cross. 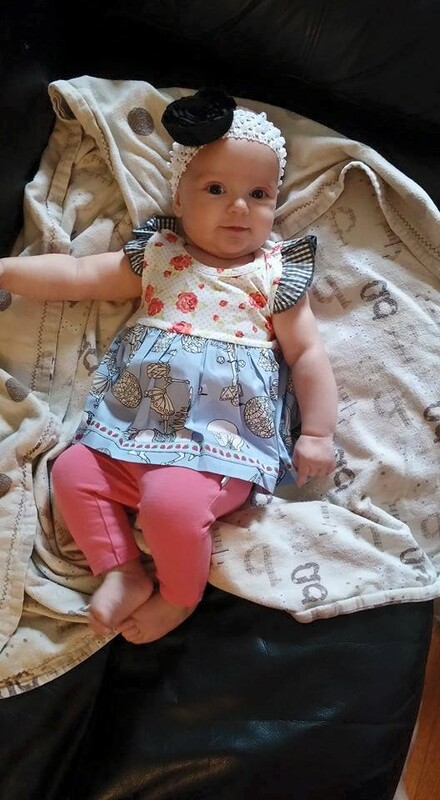 I received an email from a sweet reader asking if I would help her spread the word about her friends baby girl, Nora. 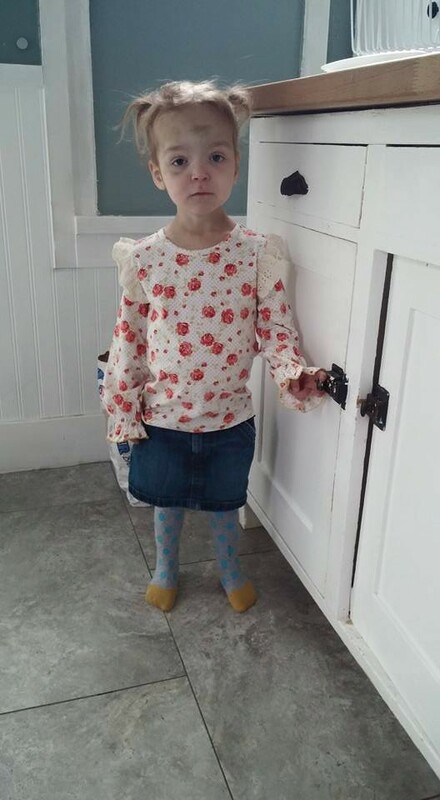 Nora was born with a rare lymphatic malformation, which affects her face, tongue, airway and lungs. 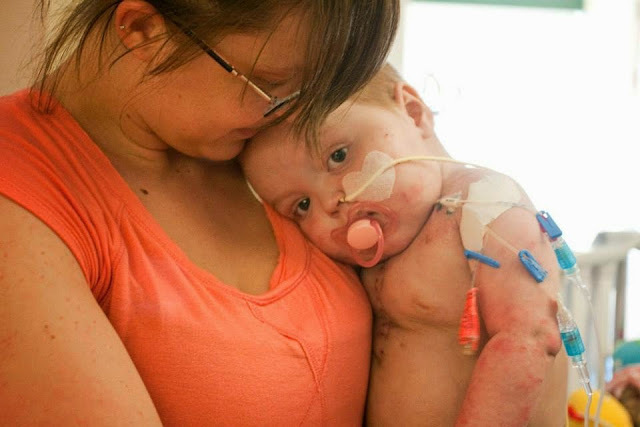 Because of this she had a trach placed at birth to allow her to breathe, and a g-tube to help her eat. She is currently traveling to New York every six to eight weeks for surgeries with a doctor that has had great success with LM patients. How cute are these sisters??? 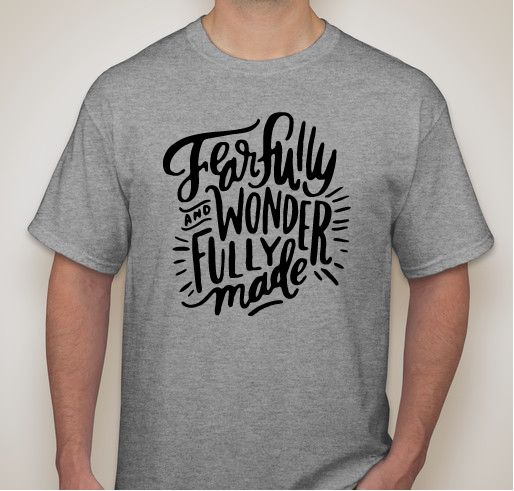 Nora's friends and family have set up a fabulous shirt fundraiser for Nora and I can't wait to wear my shirt. Isn't it awesome??? If you'd like to order one of your own and show your support you can do that HERE. 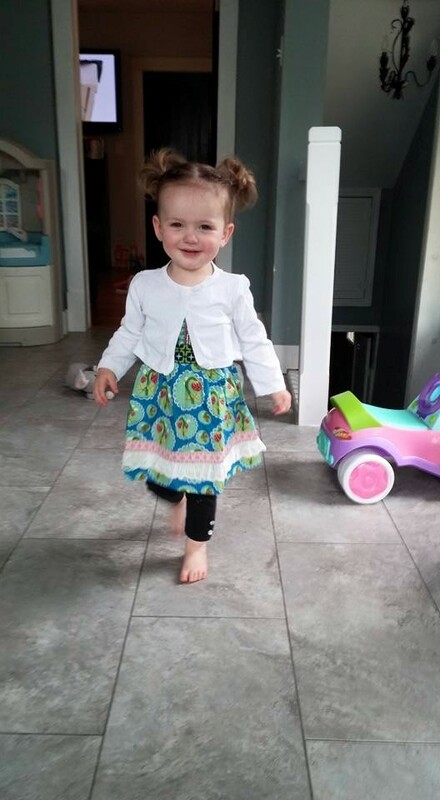 You can read Nora's mom's blog HERE to stay updated on her and find out how you can be praying for this beautiful little girl. 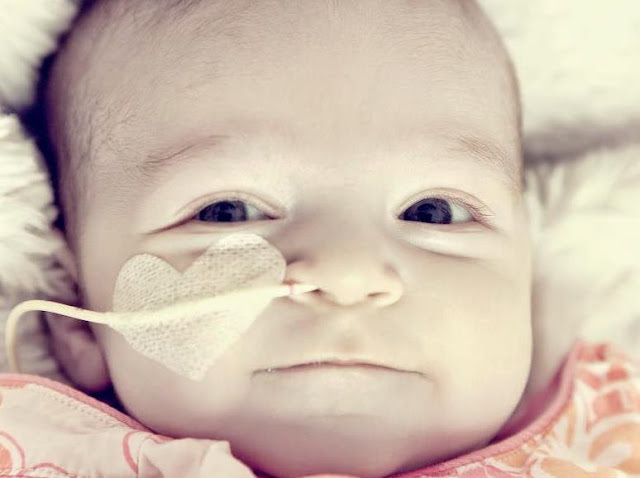 I've mentioned my cousin's daughter Aleeda on the blog before, but in case you're new, Aleeda was diagnosed with hypoplastic left heart syndrome at a 21-week prenatal checkup and she had surgery right after she was born so that the right side of her heart could take over for the left. Her heart didn't recover from the surgery and she was later diagnosed with congestive heart failure. Tania blogs HERE and I am blown away by her faith and writing. Seriously, she's amazing!!! I took my older two for vaccinations today. I, as always, tried my best to put them at ease by being open with them about the “owie” they would receive. I told them that after the “owie” they would get a sticker and a snack before we went to the grocery store. Stickers and snacks are a big deal. The grocery store, however, is the trump card. Both Aleeda and Britton handled the routine weight, height, and health check well. Then came the true test, the shot. Aleeda always goes first because she handles it all so well. She sat still. Didn’t even flinch. Not a tear or a hint of complaint. She just sat, and waited. Then she got her cookie and stickers and hopped down. Britton, however, was not so cooperative. There was screaming and squirming and serious upheaval. Tears, lots of tears. Cookies and stickers were completely ignored while she held her breath to gear up for an earsplitter. While she eventually calmed down enough for her cookie, while Britton was caught up in the drama of the moment, Aleeda was clambering to climb back on my lap for another go so she could get more stickers. Seriously. She was ASKING for another shot so she could get the reward. It is kind of crazy. But it makes sense. My little Aleeda, who has been subjected to all manner of painful procedures does not bat an eye at a bit of suffering when there are prizes to be had. 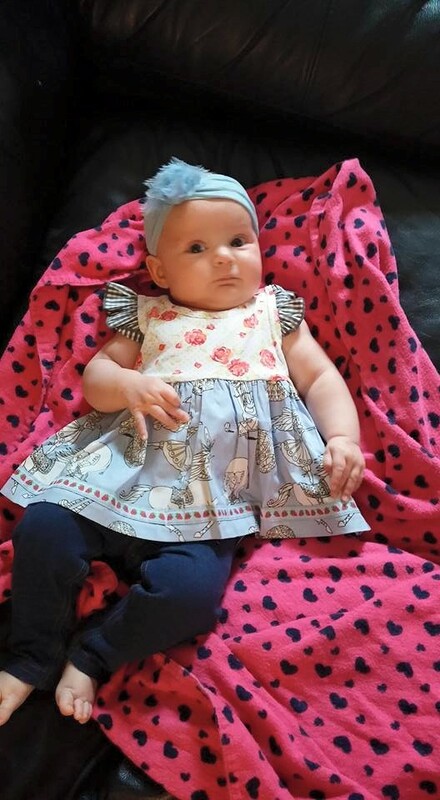 Britton, in her healthy child world, blissfully ignorant to the suffering, bucks and twists to avoid it. No prize is worth the pain. Watching this all unfold, seeing the different reactions, I finally understood something that I have struggled with since we found out about Aleeda’s condition. I understand why I, as a Christian, am called to rejoice in suffering. The reward is greater than the pain. And the more I submit myself in suffering, the greater the reward is. Eventually, suffering is something wonderful because it brings me closer to Christ, to the prize, to heavenly rewards. Like Aleeda and her stickers. She bravely faces things most people shrink from because at the end of her discomfort is something great. And her physical response has been refined by repeated testing until she no longer pulls away. I have a lot to learn from this little one. She doesn’t even realize what lessons she has brought me. This all had me cracking open my bible again this afternoon. I revisited verses I have read many times in the past three years. And suddenly it all seemed to make more sense. I have tried to force myself to be joyful in my suffering, tried to use my pain as a platform to build joy, laugh in the face of hardship. I used to try to twist and sculpt my suffering into what I wanted it to be. Sometimes begrudgingly. But I see it differently now. Suffering is to be endured. Like a surfer, I should ride the waves of pain, holding tight to the solid board beneath my feet that is faith. Heading towards trust in God as I lean into the painful waves, knowing I will come out victorious. My joy is in the rewards. James says “count it all joy, my brothers, when you meet trials of various kinds, for you know that the testing of your faith produces steadfastness. And let steadfastness have its full effect, that you may be perfect and complete, lacking in nothing.”(1:2-4) and I will admit that I like how he words this better than Paul. I want to see the trials and use them to tally up my joys. I want to look at those marks as markers for what has been gained in me. As wisdom, faith, love, discernment, service. Instead of fighting the pain, forcing joy, I want to ride the wave, to lean into the loving curve of my Father’s hand as he guides me to greater rewards. I want to remember, even in my sadness and frustration, that the stickers are coming, the joy is coming. And I want to ask for more. I want to enthusiastically anticipate suffering with the knowledge that what I gain will always be greater. So with trembling arms uplifted, I ask for more please. That I may be more. I mean WOW!!! Every time Tania posts I am blessed, humbled and find myself breaking out my Bible. If you would continue to lift Aleeda, her family and her doctors up in prayer as she is having some concerning health issues right now that they're trying to get a handle on. I don't believe in coincidences and I don't believe it was an accident or coincidence or fate that crossed my path with Ashleighs. About a month and a half ago I decided to pass along my pink tutu to someone who needed a fun, little pick-me-up and at the time I had no idea how that seemingly simple and trivial gesture would allow me the privilege of meeting one of the most amazing and strong women I've ever known. I met Ashleigh a little less than a month ago and she had JUST received clear scans and when I read her blog post this week I was devastated for her and her family. Simply put, I have THE most aggressive, fastest growing breast cancer possible - inflammatory, triple negative, metastatic, with 90%+ of my cells actively replicating. I went from a completely clear bone scan three weeks ago to too many bone lesions to count.... My cancer was also found in my lungs - in the pleural space. This is called pleural effusion. If this is how I end up dying it feels like you are drowning and you die by finally not being able to get in a breath - pleasant isn't it? This is the side of breast cancer no one ever tells you about. The doctor wouldn't give me a timetable on how long it would take me to die if we did nothing, but told me essentially to do the math given what I know about how agressive it is: it would be very, very soon. I've spoken with Ashleigh a few times this week and will let you know if there's anything you can do to help her and her family. Pray for wisdom for her and her husband as they make decisions for her treatment and for their family over the summer. Pray that she is able to find a drug trial, that she is able to enjoy time and make memories with her boys and pray for a MIRACLE! There is so much HEAVY and sometimes it's hard to know how to help or how to pray for these families given the magnitude of the situation. I struggle with feeling so small amidst big problems and when I came across this simple prayer on Ashleigh's facebook page I thought it was perfect to share. Dear Lord, even though I don't always understand your ways, I can find joy in your protection, your provision, and your process. I depend on your strength to help me today. This so such a beautiful post. Thanks you so much for sharing! Thank you so much for reading and praying! Praying for these right now, Andrea!! Thank you for sharing! So happy you shared these prayer requests. Several of them have already been heavy on my heart...but I am adding the others to my prayer list now. These sweet people. Praying for them this morning. You are the BEST!!!!! I'm starting prayer journal and will be adding you and all these wonderful people. Thank you for always bringing it back to what matters most. We have so much to be thankful for! I will be praying for all those sweet families. It really puts my "problems/issues" into perspective! Praying for all of these amazing people. Before I move on with my day, I'm going to sit here and pray right right now. These families will remain in my heart and on my prayer list. And I agree with Amber above. It totally puts my light and momentary troubles into huge perspective. I pray that God does HUGE miracles in these lives and also that he brings them peace and comfort in the storm. Praying for these families. My heart breaks for every single one of them. My heart is so heavy, too. I will be praying for these precious ones and praying for miracles. I will definitely be praying for all these families today. Thank you for sharing, and for being such a sweet person. I'm not even sure if there is an adequate response to this post, but know that I am praying! I feel the same way, thank you so much! Thank you for sharing these. Faith is hard! But seeing these trials, brings encouragement to me .. reading about them clinging to the Lord. Thank you again. You're so welcome and what a great perspective! Praying for each of these sweet families!!!! Thank you so much for posting this. Praying with you for these special request! I'm a long-time blog reader of yours. Thank you so much for posting all of these needs. My heart has been heavy for the sweet family missing in the Texas floods, and I've been praying constantly for the weeks past and moving forward. And also for Ashleigh. Thank you for suggesting Samaritan's Purse. I'm a disaster response nurse for them (was in Liberia 2x working with Ebola and recently got back from Vanuatu) and they are an AWESOME organization that really puts the money to good use and shares to gospel in EVERY situation. I can vouch for that. Thank you for caring about others. Kelly - Thank you for your work as a disaster response nurse. You are the "front line" in some horrible cases, and I believe the Lord gave you an extra Helping of compassion. It's not easy work that you do. God Bless. I agree with Laurie... thank you, Kelly! I have been praying for a few of these people already and would be humbly honored to add more of them to my list. I am so glad that you posted this. While we all carry around personal struggles, I think that this post helps all of us to keep perspective on what is truly important in life. So thank you for the reminder. Praying for each of these requests! Love that you're starting a prayer page. I have to figure out the best way to do it. Thank you! What a beautiful way to use your blog!!! Just when you think you have it bad...it can always be worse. Thanks so much for sharing and I will definitely be praying for each and every one of these featured today. May God bless you and the individuals in this post. Thanks so much for sharing, Andrea! I love the realistic side to you. We all want to be joyful and live the perfect life, but the reality is life happens along the way. I find comfort in you putting yourself out there to share things that aren't so cozy, comfy and happy. Thanks for being a light to our world! Thank you - and yes.... everyone has "stuff" going on. The story of Ashleigh hits close to home. My mom died in 2003, when I was 18 years old, of breast cancer that spread to her lungs. The doctors said there was nothing they could do because they didn't do lung transplants on patients with cancer because it would "be a waste" since the cancer would probably come back. Talk about infuriating. Regardless, I'm thinking and praying for Ashleigh and her family and know how hard it is to lose a mom. I hope there is a miracle! So sorry about your mom - thank you so much for your prayers! Thank you for being real in your posts. Not every day is happy. Some days are just plain long sad. I will be praying for these folks along with many others on my heart. Especially my sister. Agreed! Thank you so much. I've come to your blog through reading Shay's - and I must say.. You're an amazing woman. To recognize and take time out of your day to bring attention to these people brought tears to my eyes. Thank you for being so faithful in Christ and thank you for sharing. Hearing these stories sure makes everything else seem so small. Right? A healthy dose of perspective. So glad that you've found my blog and thank you for your kind words! Praying along with everyone else for these families. May they find comfort and peace during this time. So heavy... but, there is power in prayer. God is so big, so strong and so mighty...there's nothing our God can't do. Praying for these families. I love the prayer request idea and thank you, thank you, thank you for sharing these stories. Thank you so much - and I too find myself caught up in a lot of minutia that's not important. Wow! You've been a blessing to me today. I read your blog everyday, but have missed a bit because I am on Day 10 of a hospital stay. I randomly felt the urge to catch up on my blogs today (haven't had the energy up until now! ), and the first thing I read was the excerpt from your cousin's blog. Cue the ugly tears! Phew. So, thank you for sharing that. Also, I am sending my prayers to all the situations above...there are certainly a lot of hurting people right now. Hugs! Oh no! Day 10?!?! Hoping you're home now. And isn't Tania amazing??? Thank you so much for reading and praying! Wow thank you Andrea for sharing these stories. Prayers being sent. It's amazing how God puts people in our lives, and just a simple Blog can bring so much love and many prayers. Thanks for doing what you do! Holding each of the people you mentioned & their families in my prayers! Andrea, I don't even know you but I love your light and fun posts about your family. But today I needed this heavy post as a reminder that my 3 month old is healthy and alive and that my trials with bad postpartum depression is not even comparable to how bad life could be. Thank you for sharing this and giving me new families to lift up in prayer. A little healthy perspective, right? Enjoy your sweet new baby! Oh Andrea, so much is weighing heavy on my heart too! I've been keeping up with Ashleigh's story since I read about her on your blog and my heart is just breaking for her and her family. Please, please give this woman her miracle!! Then last night I found out a friend's son committed suicide. I am holding my boys a little tighter and a little longer tonight. Prayers for your friends family - that's so so so hard. 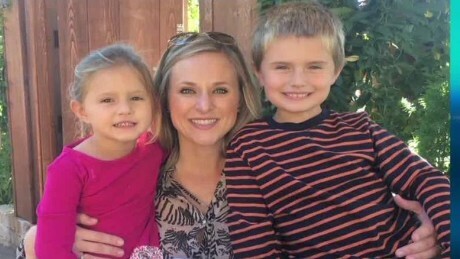 My heart aches for these sweet families. All I can do is pray for wisdom, guidance, understanding and peace. I really needed this today. My heart has been heavy all week and it is definitely over something much less heavy than these people are dealing with. Reading Tania's words about suffering and waiting for the joy was absolutely what I needed...I have been fighting all week with wanting to be in control and I need to just accept the "suffering" as a blessing instead of fighting it. Isn't Tania amazing??? So glad you read this at just the right time.